1. Heat oil in a v essel. 2. Add onions and green chilies and cook on medium flame till onions are almost soft. 3. Add salt, red chili powder, turmeric powder, garam masala and tomatoes. Cook on medium flame. 4. 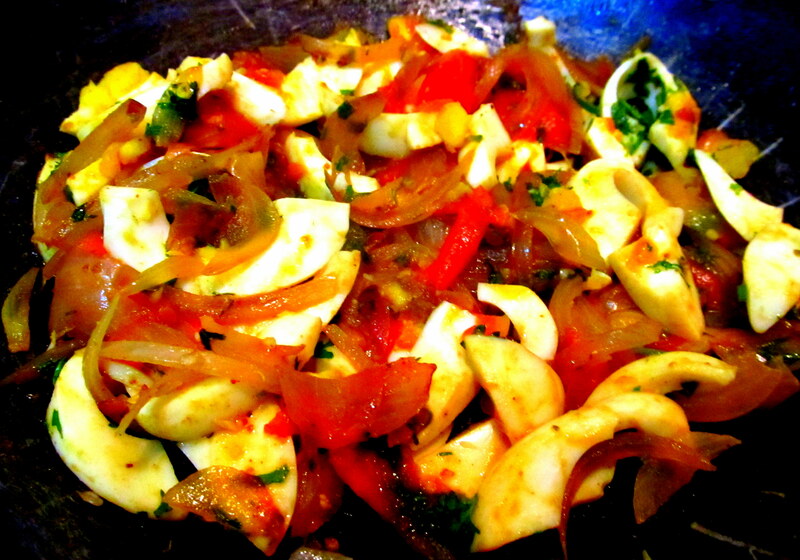 After about 3-4 mins., when tomatoes are a bit mushy, add sliced boiled egg and coriander leaves. Serve with roti or roll in a chapati to make a wrap. 2-3 tbsps. Cornflour mixed in little water – to get a dripping consistency. 1. Warm oil in a vessel. 2. Add chopped garlic. Add garlic paste. Fry on a slow flame for a few seconds. 3. Add diced onions and capsicum. Cook on a medium to slow flame for a couple of minutes or till onions are slightly translucent. 5. Add boiled chicken and cook on slow flame for a couple of minutes again, till all the flavours are infused. 6. Pour in the soy sauce. Mix. 7. Add chicken stock and bring to a boil. Add salt as required. 8. Add in the coriander leaves. Cook for 3 minutes on a medium to high flame. 9. Add in the cornflour batter gradually, stirring continuously till gravy starts to thicken. On a medium flame cook gravy till required consistency is obtained. 10. Garnish with onion greens. 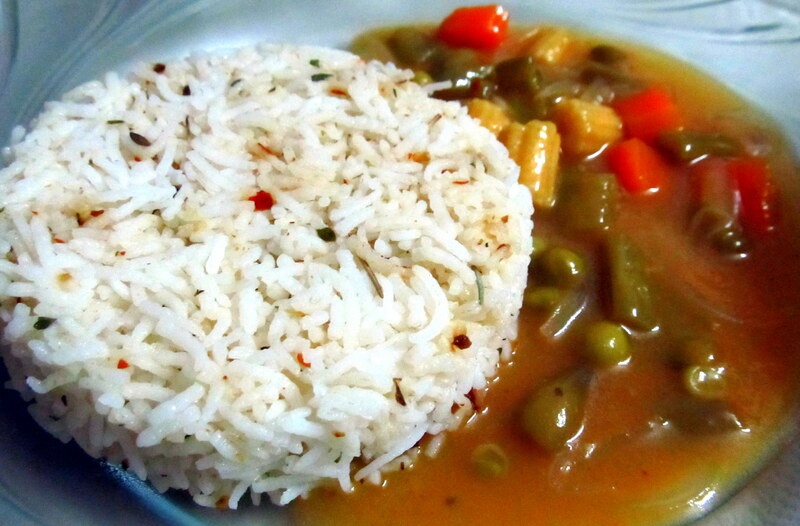 This gravy is then mixed with boiled rice and served immediately. For chicken stock – take boneless chicken, water, celery stalks and salt. 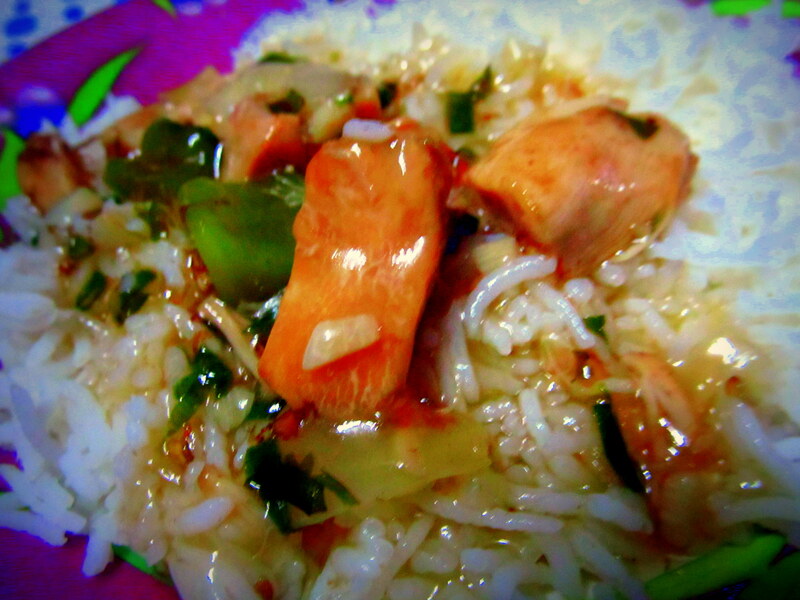 Cook till chicken softens. Discard celery. Use stock as well as chicken for above recipe. Even plain water can be used as stock. just increase the time to cook in step 5 and 7 by a minute or two each. There will be a small difference in taste only.